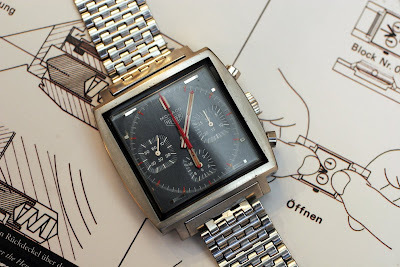 This a cool classic Heuer. 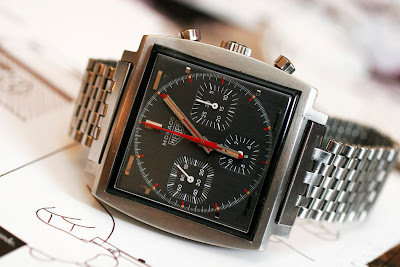 A manual version of the famous Heuer Monaco made famous from the film "Le Mans" starring Steve Mc Queen. He used the more common blue dialed 1133 B version with the automatic caliber 12. 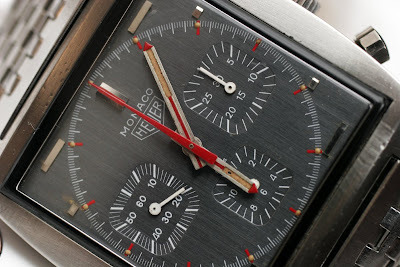 This manual Monaco is driven by a Valjoux 7736 and have a all grey dial. The ref. 73633 is known in three different versions. The blue dialed 73633 B with white subdials. And the two different dials on the 73633 G, one all grey, and the other with black/dark grey subdials. The all grey is belived to be the earliest of the two. 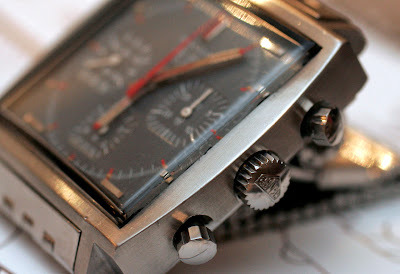 This Monaco is in good orignal condition. Very nice dial and hands. The case has not been polished. 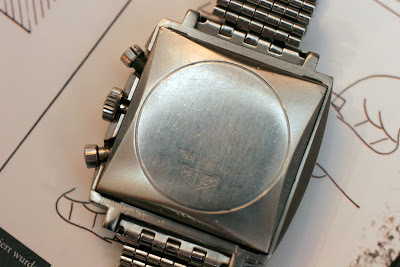 The back is stamped with the Heuer logo and Tool No. 033, the special tool required to open the waterproof case. It even have the original bracelet. That is a nice bonus. They are rare, and very expensive if you can find one. The ref. 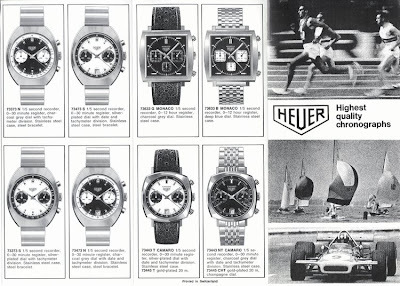 73633 G and B is listed in this 1972 Heuer catalogue. Original crown and pushers in nice condition. Most of the original finish is still visible. WOW, what a beautiful watch ! Great photos. Great page ! I have this very watch with the original band too! Any idea how much they are worth today?